So this is the second installment of my LED tests. I am using the same modified PVC true integrating sphere as all my other tests. Basically everything you need should be in the spreadsheet. So I decided to test out a Latticebright “XM-L” knock off since I have yet to see any kind of official numbers on them. 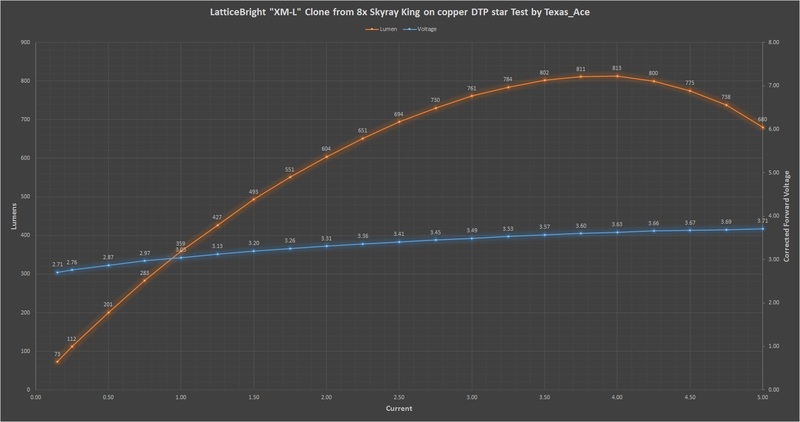 I needed a new test LED for testing drivers anyways so I reflowed it onto a copper DTP star to make testing fair. This particular LED was out of an 8x Skyray king. It was a cold tint but not anything more then you see in most lights, pretty average in tint really for a cool white. Before we get to the output test one thing does need to be pointed out about these, they may be XM-L knock offs but they are most certainty NOT XM-L’s in anything but external size. The die size is basically the same as an XP-G2 and it should really be compared to those due to this. You also get the much tighter beam with them as well just like the XP-G2 vs XM-L. Overall I was surprised at the results, I had expected closer to ~600 lumens. I stopped the test since I didn’t feel like reflowing another one at the time and I knew output would just keep dropping till it popped. I can do another test sometime if people really want to see when they blow. If anyone has any other knock off LED’s or any other LED’s that you would like to see tested let me know. I have the time at the moment but not the funds to buy random LED’s. Latticebright XM-L2 test please, they have the same die size as a Cree and are basically comparable. Also it’s really difficult to pick out the fakes. I have never managed to get a fake XM-L2 so I don’t have any to test sadly. I rarely buy XM-L2 lights to start with and the ones I have are usually “brand names” and come with real Cree emitters. When shopping ebay ect I only look at the host value so generally I am sopping the XM-L lineup. If it was a better tint then you see in most fakes then that suggests its not the same chip (second generation? ), many complain about ugly blue tint that will likely test as less lumens. I would not say better then most fakes, it is just not neon blue like some fakes. The super blue/purple tints are the odd ones out for me. I would say this one is around a ~1x tint, somewhere around 6000k if I had to guess. Way too cool for my liking but also not all that much different then most of the real Cree LED’s I get in cheap lights. I would not say better then most fakes, it is just not neon blue like some fakes. Sooo, if the die size is the same as XP-G2, how do they do de-doomed? I tried dedomed a few awhile back for the heck of it, it failed everytime, even after sitting for a week in gas. The bond wires are simply too inbedded in the dome and too thin and break off everytime. Slicing the dome works ok but you loose a lot of output to the point that while the spot is tighter the intensity is only lightly higher. Basically they are not worth dedoming. Interesting results, like I said the best I ever tried was a sliced dome and was simply not impressed. I only tried it in 2 lights though and those I didn’t try that hard. My guess would be a much higher C/W than for genuine Cree emitters. Surprisingly not really, although the tint was really not part of the test, just noting the tint of the LED for comparison purposes. I have had real Cree’s with worse tints, I got 23 Skyray kings earlier this year and out of them only 3 had real Crees but tint wise 1 of them was no batter and if anything worse the most of the latticebright. The LB LED’s also varied a lot between lights, some had a fairly reasonable cool tint such as this LED and others had a much worse tint. I even had one LB with a reasonably neutral tint. Another thing I noticed is that the tint seems to improve as you drive them harder (well until they start turning blue due to heat anyways). For the record, I am not defending the Latticebright LED’s, simply testing them and reporting the findings. Thanks TA. Nice testing again. Darn it. I just tossed out a POS Crazy Fire C8 with a lattice bright XM-L in it. I was just referring to the drop off above 4A, that seems low compared to Djozz’ tests. Poor thermal conductivity between the die and heat pad might explain that and not be surprising from a knock off emitter. Yeah, the thermal resistance in these is most assuredly much higher then real Cree emitters. In fact I would say that is by far the largest difference. If the thermal performance was better I bet it could match the XP-G2 that is should be competing against. The reflow should be good, same way I do all of mine although anything i possible. If I feel like it I might run this one up till it pops and replace it with another and then test the new one. What heat sink are you attaching it to for the tests? One of my many CPU heatsinks from the parts box. It is rated for a 90W CPU and I have ran it quite a bit higher then that back in the day. It keeps the temps down so I can easily hold my fingers on it, I have not measured the exact temps though. Thanks, that definitely puts the onus on the die. Even with the drop off, up until then it has a lower Vf and slightly higher lumen output than the XPG-2, at least when well sinked. The question is whether the higher thermal resistance will nullify that in the less perfect sinking of a host where heat does build more quickly. I’ve got a couple of cheap “diving” lights that had magnetic switches and Latticebright XML clones. The drivers went out, so I put a regular buck driver into one of them, since the battery tube was 2S and the emitters were wired parallel. Several weeks later, I forgot that I’d taken the buck driver out and replaced it with a blank contact board, because the buck driver was acting weird. I put a couple 18650s in it and turned it on. To my surprise, the LEDs were fine that way. They lit up as normal, not even turning angry blue like the Real Cree’s do when you over power them. I played with it like that for a few minutes with no apparent adverse affects. Has anyone else ever seen a 3V Latticebright XML running on 8.4V and surviving? Very strange that it survived at 8.4V. I have killed a few even with a single high drain cell actually, although they were in badly heat sinked hosts, still death was only a matter of seconds after turn on. I think one of the largest issues with the LB LED’s is quality control. The quality varies massively from LED to LED. This can be clearly seen with tint variations it makes sense it would also apply to output as well. i have some decent lb xm-l knockoffs. i suspect they can make good stuff but like any other mfr the more expensive bins do not go in cheap lights. was very surprised to get 3 matching pure white 5000k ish lb in a cheap light.